Tidbits from the Tremaynes: Um, yeah. He's not a fan. The floor? The new floor? Hubby came home from a business trip. Made no facial expression whatsoever. "Um, how do ya like our new floor?" I say, after 10 minutes of his being home-ness. I'm convinced that he doesn't see the style of the whole thing. 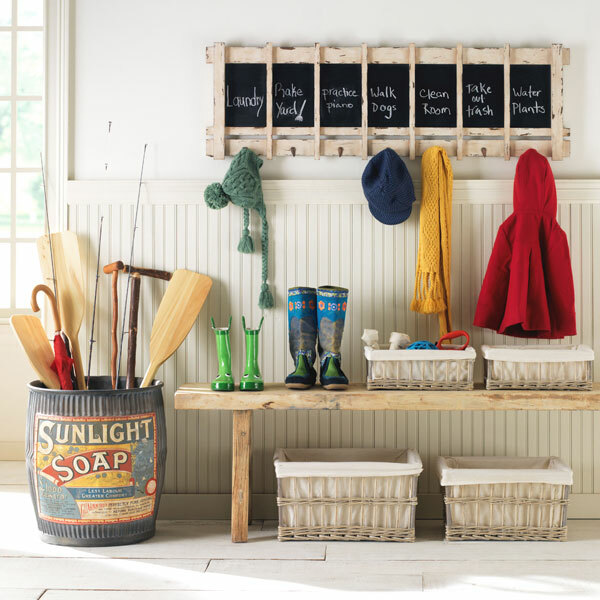 See, Jeff, we're going for an old farmhouse floor style. You know? Imperfect? Wide floor planks? White? Old-looking? Hello?? I used plywood. Yeah, I said plywood. 4x8 sheets of plywood; cut into 8 inch strips. I laid it like a regular hardwood floor. Used thee old nailgun, some pennies for a little farmhouse-style spacing, and voila. And I went right over the top of my linoleum. My daddy said I could, so neener neener. Couple coats of white paint and a coat of satin polyurethane to protect it from stains, and we're good to go here. Most importantly? The cost was $60. Now, I don't know about you, but I can drop $60 on one trip to a restaurant with my fam, so I figure if I don't like it in a few years? Who the heck cares? $60! A couple hours of labor! Big deal! But I do like it. I just love the white on white look here; it all just has a nice white-y white scheme, with a dominant note of white offsetting the other whites and bringing out the deep whites. Can't get enough of that white. Now who wants to buy me that $199 soap barrel from Wisteria? I love the floor. I think it looks good without paint as well. Kind of a bare wood feel to it, but that could just be the picture. Great idea! I love it and want it for my bedroom floor. Well done. I love the floor! I like old farmhouse looks too! It is so unique and has so much personality! Love your blog - - found you from MCP Actions from your article about "Proud to be a Hobbyist Photographer". I love that article...it is so good. I had it saved on my favorites from a while back - and I am just now getting around to visiting your blog and saying hi! Glad to know there are others out there just like me that enjoy photography as a hobby! 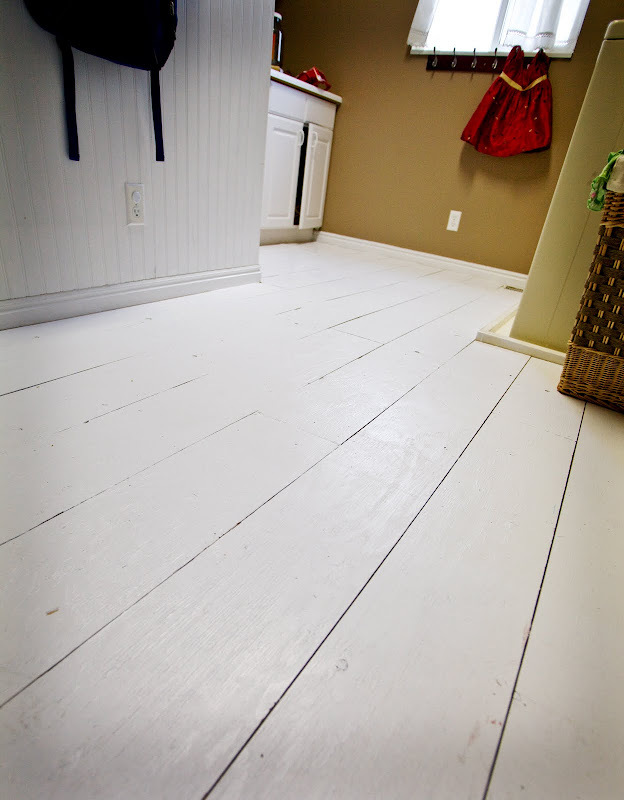 I LOVE your floor, and I think you should come put the floor in my kitchen for me! Currently we have the UBER trendy "painted cement" aka the builder was too cheap to actually put in a floor so he painted the subfloor/foundation. Yep, it's like that in our bathrooms too. I am oozing righteous indignation on your behalf. I love the floor. I think it looks awesome! And is that Kenna's christmas dress hanging there in the first picture?? That is so cute! Not a fan? NOT A FAN?????? WHAAAAT??!?!?!!!! How could he not love it? And the fact that YOU did it all by yourself...that's HOT!! =) Girl, you're AMAZING!!!!!!! I think your husband should be saying...."Wow!" 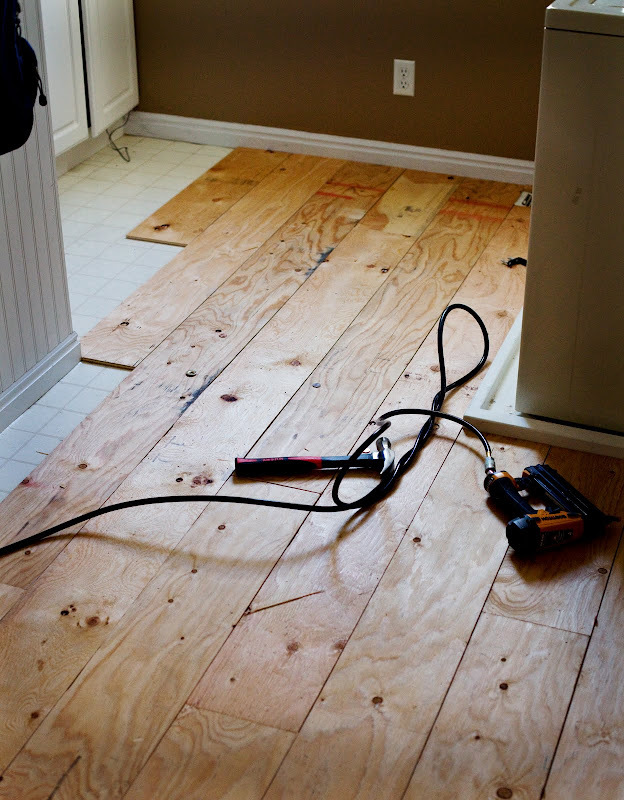 "My wife can use power tools and lay a floor while I am out of town and do it all for $60. She is soooooo awesoome!" I am a fan of the floor! Has he warmed up yet? I love it. In fact, you can come on over anytime for a couple of hours and put some floors like that in my house AND I'll even spring another $60 bucks and take ya out to dinner for doing it. It's a perfect floor! Regardless if he likes it or not, it is a billion percent better than vinyl. Heck, a loose pebble floor is better than vinyl. And it would massage your feet as you walked across it. It looks great. I wanted that look in my bedroom, but hubby disagreed. I kept thinking barn wood would be the way to go, but you "nailed" it. Enjoy the spunkiness of your blog. It looks so good! More than good - it looks beautiful. I totally agree - anything is better than linoleum. One more check in your corner for support. I love it and you should just inform the hubs that if this makes the job of washing everyone's dirty underwear even a tiny bit nicer for you, well then he just needs to get on board! I love it! It goes with all the molding. I realize you did this floor a while ago, was wondering how it held up? I absolutely love the look of the wide plank floor but mr cheapo insists we need to wait for a nice thick cut pergo type floor at $80 a box ..... we will need 50 boxes to do the first floor ( ummmmmm I don't know about you but I definitely don't have an extra $4,000 around) ..... anyways he hates wide I love wide and lived in, would love to just go for it with the floor! Did the plywood splinter when you cut it? Does the old floor show in the cracks of the spacers? Too many questions .... sorry! Really excited at the possibility of ripping out out our brown and beige splotchy carpet that we have had for 13 yrs and lord knows how long it was here before we bought the house! LOVE this! 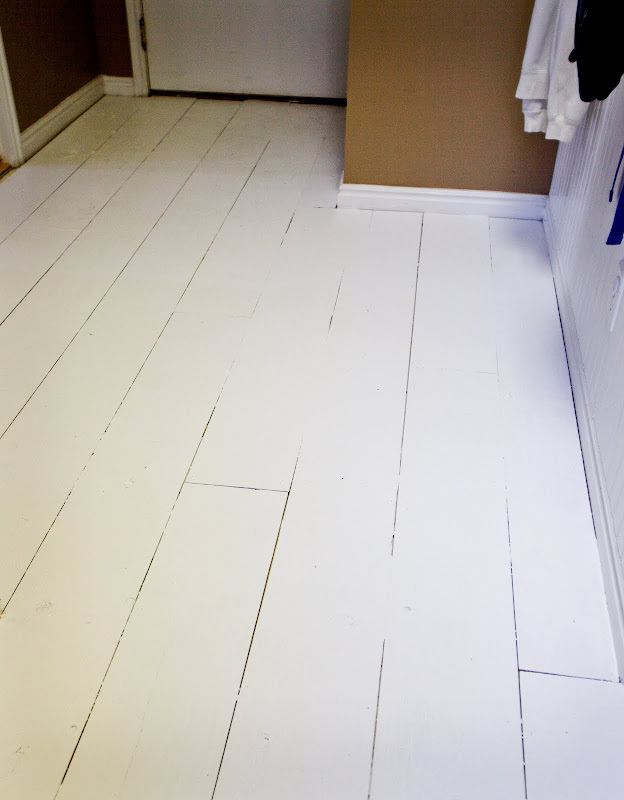 planning to do a plywood floor soon as well-I am wondering what paint you used? it looks fantastic! We did something similar in a local churchs classrooms and meeting rooms, except we used 1x8 boards instead of plywood. Put a marine grade poly over it and it really looks sharp. we just happen to live in a 100 year old farmhouse . . . love this idea! you're so smart! :) did you use 1/4" or 1/2" plywood? Beautiful Job! I would love to know the thickness of the plywood 1/4 or 1/2.. Also You nailed it down on top of vinyl floor...is your subfloor wood? I think mine is straight concrete.. Any suggestions on how to secure mine if concrete? Thanks in advance..
Men! **rolling eyes** They just don't get it!! I think it's beautiful and I'm pinning for possible later use!! the floor looks awesome. Im interested in the answers to the others questions as well. Oh man!! This is so awesome! I'm going to redo my grandmas laundry/pantry room! I was wanted to do something like this! Thanks so much for sharing this! Just gave this great post a shout out! How do you nail it down to the concrete slab? I think the floor is great.... what a cost effective solution. Very creative! Love the floor!!! What did you used to glue it to the floor? Love it! Like someone else stated, I also think the bare-wood (unpainted) looked really nice too. In fact, I think I prefer the unpainted look. I think it has a lot of character. I have some wood floors throughout my apartment now and I've been thinking of trying new floors in at least one of the rooms. I love the idea of just placing this over the existing floors, so I'm definitely adding this to my list of maybes. Thanks so much fo sharing. Ok.... I am dying over how much I love these floors! I am more impressed that you did your self! Now, quick questions... do you have dogs in the house? I would like to know how they hold up to dogs or a small herd of dogs like we have! I love these floors! We have old crappy falling apart vinyl floors and were looking for an inexpensive fix. We are so excited to try this! Thank you for a beautiful idea! I am thinking of trying this. Not with plywood but with inexpensive pine boards. Then staining and coating with 3 coats of poly. My son's piano teacher built a farm style house. She used pine boards, stained and poly, and they are holding up fantastic. 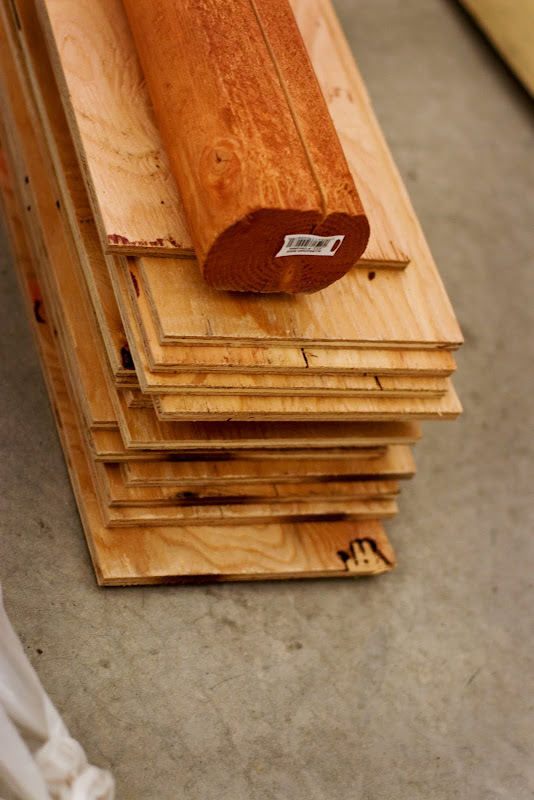 Is wood stronger than steel and concrete? Just ran across your post and love the floor! I was wondering how it has held up since doing it a few years ago? We are trying to decide on a floor for a cottage and I want yours! Love the price too! Did you have Lowes cut them down for you too?